A thriving organic agriculture enterprise based in the Englewood neighborhood of Chicago offers locally grown food and a job-training program. 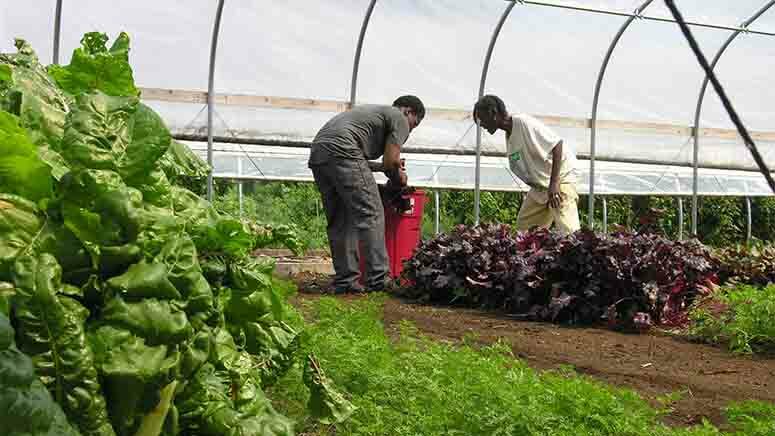 Farmers harvest lettuce at the Growing Home farm in the Englewood neighborhood of Chicago. Growing Home gives homeless and low-income individuals learning opportunities and employment in the horticulture field, as well as a unique job readiness curriculum that helps reintroduce participants into the workforce. Chicago's first permanent, year-round urban farm, Growing Home uses enclosed areas called hoop-houses to grow food in the winter. Participants take part in a curriculum focusing on skills such as planting, organic cultivating and harvesting, food and nutrition education, and basic life skills such as personal money management. They also learn marketing and sales techniques, which they utilize when working at sales booths. In addition to job training, Growing Home provides healthy produce for the Englewood community, an area that has been categorized as food desert. In 2009, Growing Home received a mini-permanent mortgage from the Chicago Community Loan Fund to help complete its first farm location. The loan also enabled Growing Home to maintain essential reserves of cash so that it could continue as a successful and stable organization. Praxis Mutual Funds® supports programs and projects like Growing Home and CCLF through investments in Calvert Foundation, an impact-investing institution that helps people around the world through community development financing. It’s part of the Praxis commitment to place approximately 1 percent of each of its funds to benefit neighborhoods and individuals through community development investments.